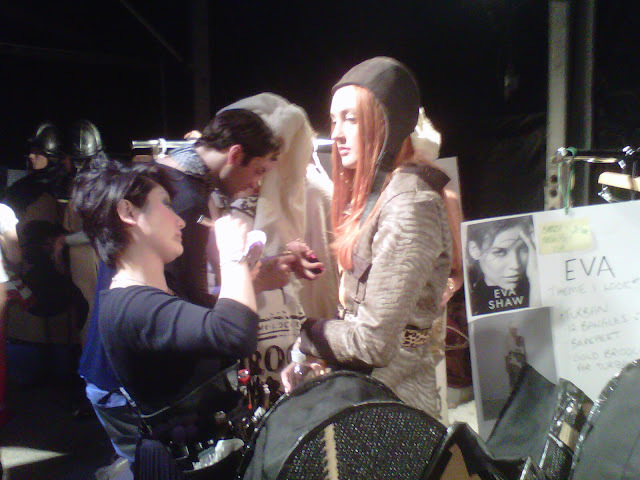 Backstage at the KORHANI Show was like being backstage at three different broadway musicals. Costumes, costumes, costumes, made of carpet! How the teeny models managed to walk the runway wearing garments that probably weighed more than them is beyond me. Imagine picking up the carpet on your floor, draping it over yourself, strapping on some stilts, and finally strutting down a runway in front of Canada's most important fashion people. Got to hand it to those models, they managed to make it look like a piece of cake. I would never be able to do it. I think I broke a sweat lifting one of the jackets off the hanger to put on the beach boy model I dressed on my first shift. Anyway, back to my idea of theatre. The line was divided into three very obvious themes: arabian nights (with a little aviator mixed in), 80's rocker/beach, and Alice in Wonderland. The arabian nights theme opened the show. When I think carpet or rug the first thing I associate it with is Morocco or Persia (Iran now a days but you get my point) and that was obviously what Kirsten Korhani, Creative Director of KORHANI home, had in mind. The models were decked out in bright coloured turbans and carpet robes. In this photo you can also see the Aviator idea. There were three models wearing aviator-inspired coats and trousers in khaki, brown, and camel. Note the cap, probably the most obvious of hints. The model was also given goggles to wear on the runway. The second part of the show was all about 80's rock and Hawaii Five-0-style swimwear (made of carpet lets not forget) There were huge shoulders, bright colours, big hair, bangles, high weist belts, mesh gloves, and studs. For the big finale, KORHANI brought out the big costumes. Literally. The Alice in Wonderland part of the show was elaborate, dramatic, and fun. The audience loved it. 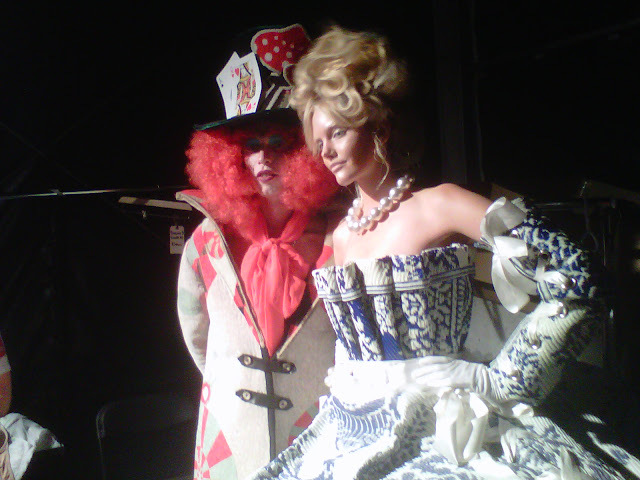 The costumes were incredible and the models looked great. Especially the models dressed as Alice, the Mad Hatter, and the Queen of Hearts. Overall, the KORHANI home show was super entertaining with its elaborate carpet garments. It's crazy to think that a home decor company could produce such inspiring piece of clothing based on their rug designs. Putting your patterns and rugs on the runway has to be the best way to showcase something as lame as carpets and rugs. Good job KORHANI home for being creative!